Deep indeed. These people hate each other nearly as much as I hate them all. GB is in pathological denial. EM, tho I don't share his politics, does not appear to be insane. stupid enough to think that people won't notice he was part of the failed Gov't he now criticises 6 months on?........could be! To be fair to Ed, he doesn't seem to be as much of a scumbag as the rest of the old guard he served with. In fact during the civil war between the Blair and Brown camps he was the only Brownite that the Blairites could actually communicate civily with. I guess now he;s the man in charge he's going to get rid of as much of the gangsters as he can so he can create a less dysfunctional organisation. Doesnt matter how many times you say the same thing Gordon, doesnt make it true you knuckle dragging moron. don't you mean trying to keep the unions happy while trying to keep appearing right enough to look electable or doing a 'Kinnock' and going left off the edge off a political cliff? Mr Brown has told friends he is ‘absolutely furious’ with the new leader over the criticism, which he believes is unfair and plays into the hands of the Tories. I am shocked by this news. Yvette Cooper will be next labour leader if Ed the Unready does not last. One of the side-effects of the Blair /Brown thing they had going was that anyone could have a job so long as they were on one side or the other, consequently they have absolutely no talent around. Yvette Cooper is completely useless and would be hilarious as "leader". Whilst I think Ed Millipede will be a disaster as Leader and trashing Brown will not play well for him, it is wonderful to see Browns "legacy" disowned so fast. The body is still warm and they're burying it already. I'd love to hate him, I really would, but he's done nothing to merit it yet. He just seems like a Hague style leader. won't win the election, swiftly booted out. Ed Miliband, what can I say, except oh dear. I'd love to hate him, I really would, but he's done nothing to merit it yet. Similarly Cameron, similarly Clegg. We need a Churchill, an outlier. The hours I spend viewing the European Parliament live, reading all the new Regulations and Laws, viewing the speeches of MEPs from all Groups, I suddenly have feelings of fear for our future. The Lisbon Treaty has the power of making National Parliaments sterile and the populations of the EU countries have not a ******* clue what is really going on. When Martin Shultz up next as the President of the European Parliament then the small band of 33 MEPs of the FDG will be silenced. In a recent session a group held up banners and were not disciplined when Gerard Batten of the FDG on a point of order challenged why their banners were the subject of a fine, a voice was heard saying they were critical the EU. Say no more. One of Reds first move's I actually approve of .... good job he got the votes in before mentioning it ..he he ! 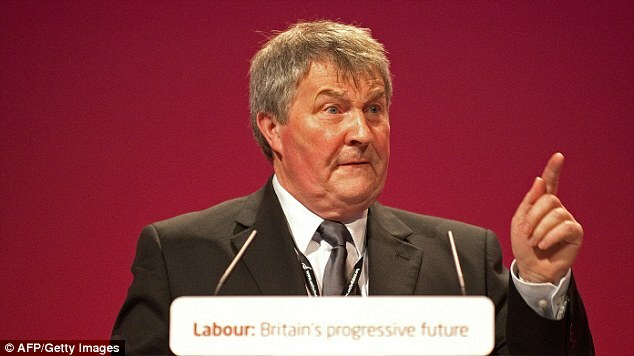 Ed Miliband has provoked fury by overturning Gordon Brown’s pledge to hand a peerage to the boss of Britain’s biggest union.The new Labour leader has decided to refuse to send Unite general secretary Derek Simpson, 65, to the Lords even though his union played a key role in his election victory.